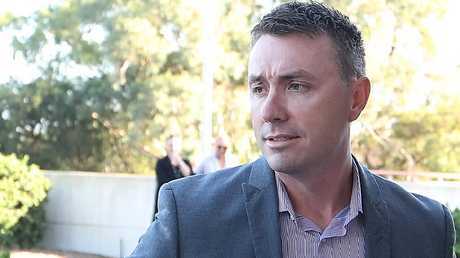 FIGHTER and pilot James Ashby is the latest man to sit at Pauline Hanson's right hand, and the most controversial. He has a history of a swiftly detonated temper, and a thing for mobile phones when it explodes. He is now so controversial he has been barred from Parliament House after a public and violent altercation with former One Nation senator Brian Burston on Wednesday night. He has been accused of scuffling with him and harassing Mr Burston and wife Ros with a mobile phone. Senate President Scott Ryan withdrew Mr Ashby's parliamentary pass, on the basic principle you can't go around roughing up senators, even if you are Pauline Hanson's chief of staff. Mr Burston, now with the United Australia Party after a row with Ms Hanson on tax policy, was himself once a Hanson right-hand man. Ten years ago he was a member of the triumvirate, with Ms Hanson, at the top of her party. This was before she was a Queensland senator and he was a One Nation senator for NSW, and before he became an Ashby target. 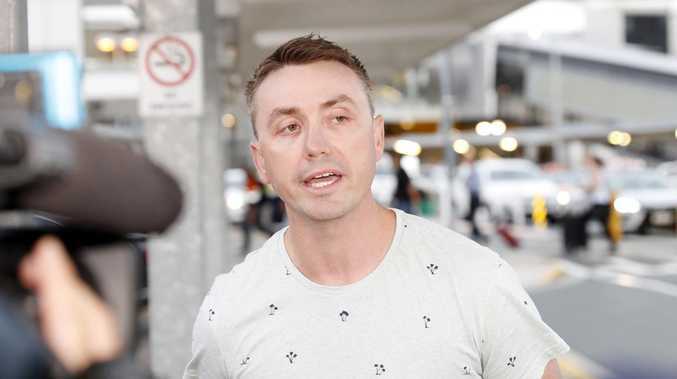 James Ashby follows a line of men - David Oldfield, David Ettridge the most prominent - who have been political partners with Pauline Hanson only to be dumped. Mr Ashby is expected to avoid that fate. He arguably is the first with political experience at a senior level, even more than Mr Oldfield had worked on Tony Abbott's staff. And he came to Ms Hanson's office already the subject of scandal. Mr Ashby's first career was in radio and he worked on a number of provincial Queensland stations. In 2002 he quit a Newcastle FM station after allegations he had verbally harassing a presenter at rival station in four offensive telephone calls. He has said he was fined for the offence. His political experience began when he moved to Queensland's Sunshine Coast as marketing manager for a fruit grower. His next step was to become media adviser to Liberal Peter Slipper, then federal MP for Fisher. In 2012 Mr Ashby became a national figure with his claims he had been sexually harassed by Mr Slipper which included sexual advances, several suggestive text messages. He claimed Mr Slipper asked him to shower with the bathroom door left open. Incidentally, in the same year he was the subject of a protest after taking and throwing the mobile phone of a local reporter who asked questions Mr Ashby didn't like. A court battle over the sexual harassment claims began in late 2012 and didn't end until February 2014 when Mr Ashby dropped his action. 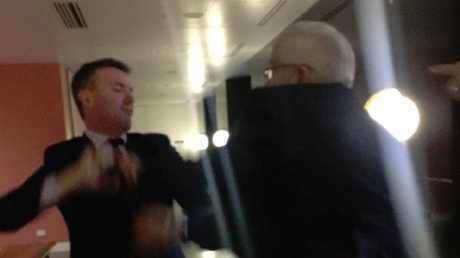 Senator Brian Burston and One Nation adviser James Ashby in the physical clash on Wednesday night. However there was further controversy in 2015 when police raided his home and that of his parents in an investigation of allegations Mr Ashby had illegally removed Mr Slipper's official diaries. This was the year he took the fateful step of signing on with One Nation as a media adviser - a key manager of the promote Pauline strategy, and a campaign adviser. He was quick to show how intensely he took the job. In late 2016 he was the subject of a complaint by then Senator Rod Culleton's chief of staff that Mr Ashby had thrown a mobile phone at her. His boss, Ms Hanson, dismissed the incident saying it had only been an underarm throw. In the same month Mr Ashby issued instructions to reporters at a press conference organised by then senator Malcolm Roberts - who like Mr Culleton was, under the Constitution, not qualified to sit in parliament. He told the journalists not to ask questions outside the Mr Roberts' topic of a conspiracy to promote climate change, and was taken aback when they laughed at him. But his influence on Pauline Hanson was growing. In fact it was going up. Ms Hanson had been given a light aircraft and she needed a pilot. Mr Ashby was licenced and soon was flying her on campaign rounds. 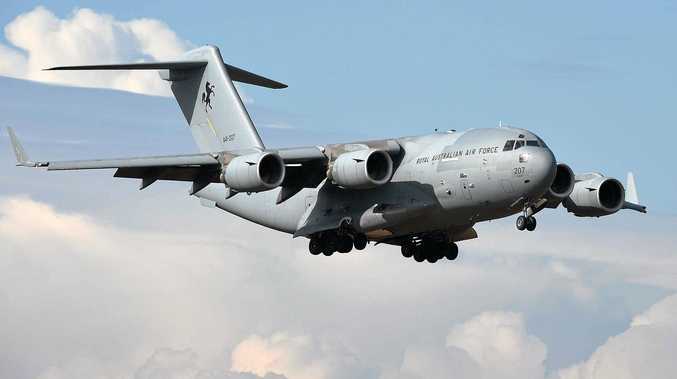 The aircraft was later found to have had ownership recorded in Mr Ashby's name as officials tried to determine whether it was an undeclared political donation. Despite it being a small group in parliament, Mr Ashby managed to offend One Nation staff, and there were complaints about his aggressive behaviour. And unhappy One Nation candidates also were not impressed by him, author Kerry-Anne Walsh writes in her book Hoodwinked: How Pauline Hanson Fooled a Nation. She quotes an email from one: "You, James, should be ashamed, you're nothing more than a bully and this is not a good trait in a person." But his aggression had one purpose: Protecting Pauling Hanson, who has her own temper issues. And while he was doing her service he was safe from criticism. "Their's was a political union made in heaven. Or Hell," wrote Walsh. "Both had itinerant personal and professional backgrounds, political rat cunning, narcissistic qualities and an entrepreneurial eye for a financial chance."